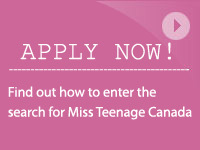 ← Miss Teenage Canada Crowned in Toronto! Degrassi: the Next Generation’s Paula Brancati and Adamo Ruggeiro to Host The Search for Miss Teenage Canada Event on July 25, 2009 at The John Bassett Theatre at 8 p.m.
Toronto, ON: Michelle Weswaldi, Executive Director of Miss Teen Canada-World, today announced the line-up of talent and hosts for the show for Miss Teenage Canada on July 25 at the Metro Toronto Convention Centre, John Bassett Theatre at 8:00 p.m.
Paula Brancati, has been on three seasons of Degrassi: The Next Generation, and can be currently seen as a recurring character on CBC Television’s popular series Being Erica. Paula’s passion for the arts also extends to music, in which she is classically trained in both voice and piano. She was recently nominated for two 2009 Dora Awards in the category of Outstanding Female in a Musical and Outstanding Performance in a Featured Role. Paula’s past television credits include a leading role on the CBC series The Blobheads, guest appearances on Life With Derek, Heartland, among others. In 2006, Paula was nominated for a Gemini Award for Best Performance in a Children’s Youth Program or Series for Dark Oracle (YTV). Adamo Ruggiero is an experienced television host, having hosted/co-hosted such shows as the MTV Hills After Show, Video on Trail, Canada’s Next Top Model, the 22nd and 23rd annual Gemini Awards as well as hosted multiple stories on CTV’s E-Talk. Adamo most recently hosted the first season of YTV’s hit series The Next Star, where he led the national search for Canada’s next, young singing sensation. In 2002, Adamo began working on the second season of Degrassi: The Next Generation as Marco Del Rossi. Throughout seven years on the show, his role as a gay teenager has garnered much attention. In an attempt to share his story with other struggling gay youth, he has lent his name to The Trevor Project where he shot an international PSA alongside Roseanne Barr, T.R. Knight, Kristin Davis, John Goodman and Neil Patrick Harris. In April 2008, Degrassi was nominated for its second GLAAD Media Award where Adamo was invited to present at the Kodak Theatre in Hollywood alongside Ellen DeGeneres, Rufus Wainwright, Sharon Stone and Tom Ford. He is currently, a student at York University in Communications Studies and Film Theory. For years, musical powerhouse, Divine Brown has been quietly carving out her own history on the Canadian R&B and soul circuit. In 2005 she released her much anticipated debut album, “Old School Love” which cemented Divine’s reputation as one of the country’s strongest urban talents. In 2008, she released “The Love Chronicles” which spans everything from bop-shoo-bop to sassy surf’n’soul kiss-offs to sultry late-night neo-soul. She has won a Juno Award for Best R&B/Soul Recording of the Year. Recording Artist Gary Beals is a Juno Award nominee and a five-time African Nova Scotian Music Award winner, Canadian Independent Music Award and East Coast Music Award winner, a Canadian Urban Music Award nominee, Canadian Radio Music Award nominee and a Planet Africa Rising Star recipient. His hit single “Summer Nights”, had steady rotation on radio stations across Canada, and the video to the single helped propel Gary’s Top 10 Album. The album received a 2005 Juno nomination for R&B Soul Recording of the year and a 2004 Canadian Urban Music Award nomination for New Artist of the Year. Through Gary’s success on Canadian Idol, he acquired a record deal with Plasma Records and Kindling Music, owned by judges Farley Flex and Jake Gold. His latest album, The Rebirth Of… was released on June 9, 2009. 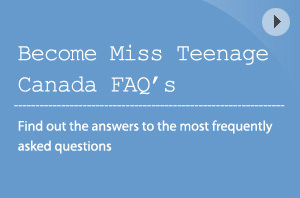 The Miss Teenage Canada (MTC-W) Competition is the only national search that conducts provincial competitions across the country to select 54 finalists for 2009. The staged show produced in each province is to showcase the girls’ talents and the overall winner becomes “Miss Teen” of their home province. The remaining finalists are awarded city titles and invited to travel to Toronto with nine other provincial winners to compete for the title of Miss Teenage Canada on July 25, 2009. MTC-W is the only competition that has the rights to send the winner to the International Miss Teen World Competition. Organizers have searched the country for the best of the best. These Canadian teenage finalists are those who will compete for the title of Miss Teen Canada-World to represent Canada. Miss Teenage Canada 2009 will go on to represent the country and compete in Houston, Texas, for the coveted Miss Teen-World title in August 2009. This final Canadian competition will be held in downtown Toronto on Saturday, July 25, 2009, at 8:00 p.m. at the John Bassett Theatre at the Metro Toronto Convention Centre. Girls aged 13 – 19 from across Canada will compete for the coveted title and the largest prize package awarded in a Canadian teen competition. Over $25,000 in cash, prizes, and scholarships will be awarded to talented aspiring teens. During their time in Toronto from July 19 to 25, the semi finalists will be seeing all the local attractions and experiencing Toronto’s hospitality with their Moms and families. “We thought that since the winner will be volunteering in Kenya in 2010 on a Me to We trip, it should be a requirement for the MTC-W Competition for each national delegate to raise $400 within their communities towards Me to We’s charity partner Free The Children.” Says Weswaldi. The winner will be invited to participate as a volunteer on a Me to We trip. This experience is to gain first-hand interaction by visiting a Free The Children project overseas. Their commitment to youth is to engage them in global development and social issues education so that they take action to make a difference. Miss Teenage Canada provides the winner with the opportunity to be an ambassador for Canada with the mandate to empower youth to take a leadership role in their communities. The girls have already learned first-hand about becoming a positive role model, and contribute to projects in their community by raising funds for Free The Children. By July 6, the girls collectively had surpassed the goal of $20,000 and have today raised over $30,000 for Free The Children. The girls will also be judged on academic achievement, presentation and self-confidence and community contributions, all of the qualities that enables a young woman to become a leader of tomorrow. Tickets are on sale now and available at Ticketmaster and are $35 and $55 each plus service charges. Lead sponsors are: Faze Media, BEINGGIRL.CA, Elmer Olsen Model Management, Pro Makeup, Toronto Academy of Acting for Film & Television, FANTASY GEMART, Novotel Hotels, Jeanne Lottie, Fredas, Fiorio group and Via Brazil.